The president also took to Twitter to campaign for our bid, while issuing a veiled threat that extended beyond the soccer field. One problem? North America is competing with Morocco for the 2026 bid. 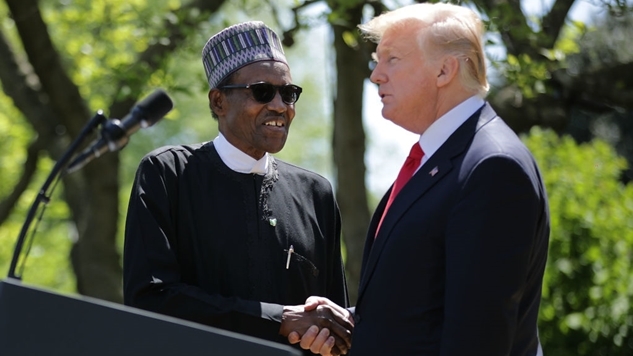 Nigeria is not going to support North America, because, well, they're not in North America. They're in Africa. So they're going to support the African nation. It's the World Cup, this shouldn't have to escalate into the realm of diplomats. But because president brain worms is only concerned with “wins,” and losing a World Cup to the African continent will not sit well with our white supremaPOTUS and his fanboys, what should be a spirited competition in rampant corruption may now spill out into the diplomatic realm. FIFA is an international criminal organization whose front is the chief governing soccer body in the world. I mean this literally. Like any good mob, FIFA squeezed Brazil to change their laws on banning alcohol during soccer games because Budweiser (these laws were in place because lots of people died—soccer hooliganism makes American sports hooliganism look like a 10-year old's birthday party). The 2015 corruption scandal ensnared everyone in FIFA leadership, and resulted in 18 indictments of individuals and two corporations—including nine FIFA officials and five businessmen. FIFA responded to Trump's unsubtle insinuations by hilariously pointing to their ethics rules, which are located on a roll next to one of their golden toilets. Trump and FIFA sparring over “ethics” is the ultimate Spiderman pointing at Spiderman meme. (Denver to New York City) + (The right-hand side of the Atlantic Ocean to the left-hand side of the Pacific Ocean) = South Africa to north Africa. You can't play the “but South Africa” card here. Having another World Cup in Africa would be a big freaking deal for an 88-year-old tournament that has hosted some of the greatest African soccer moments ever (U.S. soccer fans are well aware of a couple for Ghana), but only once on African soil. It just means more over there, and a second World Cup would just be the start of making up for lost time. Hell, the Ivory Coast paused a five-year civil war in 2006 to watch their team compete in the World Cup, and a peace agreement to end the conflict was signed in 2007. Frankly, Morocco should win. We are witnessing the expansion of the world's most popular sport right now. Russia is hosting this year's World Cup for the first time, then the surface of the sun in Qatar gets its first ever bid in 2022. In 2026, it will either travel to North America for the first time in a quarter century or to north Africa for the first time ever. If we're just following the laws of supply and demand for the sport of soccer, Africa should defeat North America (sorry Mexico, but football and hockey reign supreme the farther north you travel here and you know it). Russia, France and Belgium have joined several other African nations to back Morocco's bid, and now the race is much closer than anyone expected. The United States is the ultimate untapped soccer market, and FIFA will do everything in its power to try to unlock our $19 trillion economy—especially in light of our pathetic soccer program failing to qualify for the 2018 World Cup in a CONCACAF division specifically designed to put the U.S. and Mexico through to the World Cup every four years. American soccer needs a jolt now more than ever (just don't tell Trump's biggest fanboy on Twitter). On the greed scale, North America makes far more sense. Ultimately, as the cartoonishly openly corrupt Qatar 2022 bid proved, those who grease the wheels with FIFA tend to get what they want. Trump is thinking about this all wrong. He wants to punish nations who vote against our bid, but recent history proves that subverting the vote altogether is the best play with FIFA. Democracy is secondary to straight cash. This entire play is right in Trump’s wheelhouse. Meet some sketchy folks in a steakhouse in some corner of the world. Devour a charred piece a meat that’s better suited to be worn on someone’s foot (thinking about all the $50+ steaks that he’s ruined makes my blood boil), then leave with a shadow agreement and a bank account number in the Cayman Islands to make a deposit to. After that, go collect your reward. THAT’s how the United States can win this World Cup bid, not by doing the FIFA equivalent of shaking hands and kissing babies. Frankly, it’s seeming more and more like our only hope the more you examine the momentum behind Morocco’s bid. We just can’t leave it up to Trump to help whip up a popular vote victory on June 13. We already know how that story ends.